Sage essential oil: Clary & Dalmation. Clary Sage oil is steam distilled from the leaves of the Salvia sclarea plant. This hardy, perennial, plant grows 2 to 3 feet tall and wide. It has large felted deciduous leaves with square shaped stems, covered in tiny hairs. It blooms colorful flowers of pink, white or pale blue in late Spring or early Summer. It grows well in full sun and in large containers. It's native to the north Mediterranean, north African and central Asia regions. Clary Sage has been used, historically, as a medicinal herb. Today it's grown for its essential oil. The word "clary" originates from a Latin word "clarus" meaning "clear" or "bright". The word "salvia" originates from a Latin word "salvere" meaning "to be well" or "in good health". In the Middle Ages, Clary Sage was nicknamed "clear eyes". It was used in preparations for treating eye conditions. Egyptians believed it could cure infertility. Greeks, Romans and Chinese believed it assured long life. German winemakers added it to inferior wines to make them taste more intoxicating. Clary Sage essential oil is light, golden, in color. It has a thin to medium consistency and earthy, herbaceous, subtle, fruity scent. Clary Sage "Absolute" has a hint of peppermint and is sweeter than Clary Sage. - Reduce hair loss; prevent thickening in membrane tissue surrounding hair follicle, creating hair loss. CLARY SAGE USES: burners, vaporizers, massages, baths, creams, soaps, lotions, shampoos and anti-aging skin care products. Blends well with essential oils: juniper, lavender, geranium, sandalwood, jasmine, frankincense, ginger, rosewood, rosemary, hyssop, tea tree, lemongrass, lemon, orange and other citrus oils. Dalmation Sage, (Common Sage), oil is steam distilled from the Salvia officinalis perennial, evergreen, shrub. 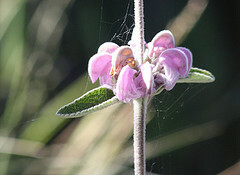 It has woody stems, grayish-green leaves with white, pink, blue or purple flowers. This dwarf shrub grows approx. 2 feet tall and wide. It's native to the Mediterranean region. Common Sage differs from Clary Sage chemically and aromatically, but it has similar benefits. It has a strong herbaceous, fresh, fruity aroma. Its aroma can be bitter or biting. Do not substitute Clary Sage for Common Sage or vice versa. Their aromas are distinctly different. Common Sage oil is clear in color with a thin consistency. CAUTION! Common Sage is more likely to cause skin irritations than other essential oils. Blends well with essential oils: bergamot, rosemary, mandarin, orange, grapefruit, lemon, lemongrass. 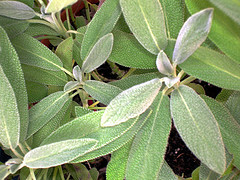 COMMON SAGE USES: perfumes, soaps, lotions, creams, candles, detergents, massages, cosmetics, deodorants, aromatherapy. MAKING SOAP: Add bits of flaxseed meal in a goats milk soap recipe. Add lemongrass and sage essential oils. Cleanse, exfoliate and invigorate your skin after a hot day outside. This blend of ingredients makes a a nice body scrub soap. MAKING HOMEMADE SHAMPOO: Add clary sage to shampoo for oily to normal hair. Get rid of dandruff. Remove build-up. Stimulate scalp. Cleanse. Add body, bounce and volume to hair. Lemongrass oil is a nice complimentary blend. - Keep Sage essential oil away from babies, children and pets.